First of all, you have to remind yourself that this movie was taken from a series of comic books lesser known to Americans. As with the plethora of action/hero films which US moviegoers are generously provided continually, that’s how you’ll be able to buy into the fantastic things that also occur in Valerian and the City of a Thousand Planets. It was created in1967 by writer Pierre Christin and artist Jean-Claude Mézières. French director Luc Besson did the script and directed the film. It’s playing now just about everywhere. It’s likely to entertain you right out of your spacesuit. Prepare as well, for something else before you see it. 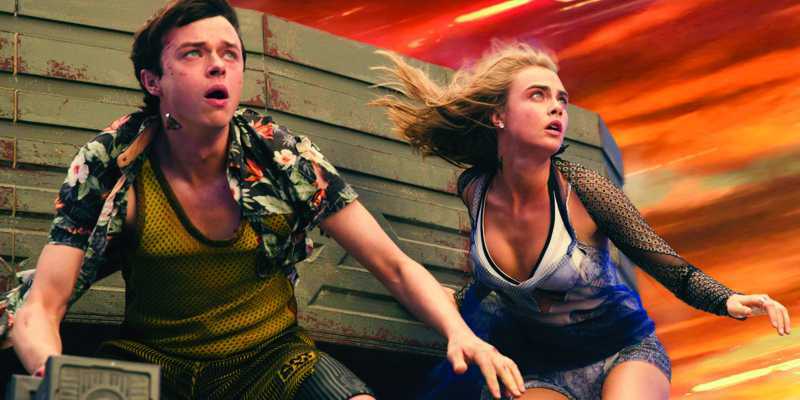 Dane DeHaan, who plays Valerian, sounds a bit like Keanu Reeves delivering lines. But on the plus side, DeHaan is good actor. Dane did a fine job recently in a curious and rather off beat, catchy movie called A Cure For Wellness (I reviewed it). English-born Cara Delevìnge, a 25-year-old fashion model of considerable merit, plays Laureline. She’s Val’s military associate and partner, but mostly the apple of his eye. Laureline doesn’t yet play or hear Valerian’s tune so much, but it’s plain to see that, in a later “reel” of the picture, her attitude is heading for a transformation. The Christin/Mézières original included Laureline’s name in the series’ title. And in the picture, Besson gives her a definite edge. Ms. Delevinge swings through the narrative with much the confidence and aplomb of the person whom we usually see when Jennifer Lawrence is the female star. 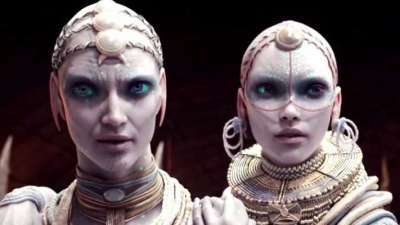 Visually overwhelming, Valerian is formulaic. I hate to say hackneyed, but: I think I’ve seen this film before and not just once. Heavy on action, cute scene closers and, as I say, just plain awesome stuff for your eyes. (In 3-D already.) The opening scene on a beach of this amazing planet came close to blowing me away. The several “Avatarish-looking,” but more attractive natives basking in Besson’s blazing sun are just more than interesting. Their voices demand your attention. The myriad cities on this planet have long been at peace, and hardly anyone living in any of them is uptight about other folks who might be a different color or even have larger heads or arms than they. (Christin and Mézières leaned left doing their creation.) Thousands of languages are spoken. And everything seems pretty cool. This is all made clear early on. Hold on, though. We can’t have a good movie sans conflict. Oh yes, there are the bellicose among the many. 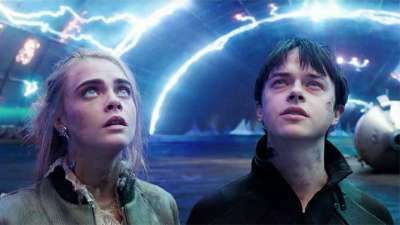 Valerian and Cara have been tasked to make sure that the good and various kinds of beings in this big bunch of planets making up one city are looked after, even though Val and Laureline each have slightly differing philosophical takes on how that should be accomplished. This becomes more apparent later. Clive Owen, a really fine actor, gets to play Commander Arun Filitt. Getting a good read on Filitt isn’t easy. Then there’s a magnificent bordello, carnivalish scene when Rihanna does her thing as Bubble. The girl can dance! But Holy Hawke! Ethan’s around for this catchy scene too by being Jolly the Pimp for an out-for-the evening-on-his-own Valerian, who sits entranced with Bubble’s terpsichore. No jazz is played while she dances, but jazzers will surely flock to this motion picture since Herbie Hancock is seen (mostly on a computer screen) as the Defence Minister. No one has provided Mr. Hancock with any kind of keyboard, whatsoever, nor have the strains of “Dolphin Dance” been applied to the film’s soundtrack. Then with another cameo jab, Besson stretches for a little Blade Runner nuance casting Mr. Rutger Hauer as the President of the World State Federation. Rutger looks more like Abe Lincoln here than Roy Batty. You do remember Roy. Trump Agrees to Lie Detector Test… Maury Povich Scores a ‘HUUUGE’ Get!